A MOVIE ON DOMESTIC VIOLENCE AND IMMIGRATION LAWS. Shah Peerally Productions proudly presents "Shattered Freedom," the latest episode in the story of "An American Dream," from the series, "The Immigration Lawyer." 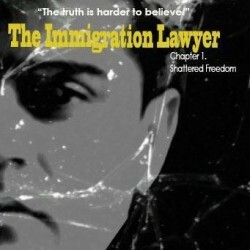 Inspired by the hardships and struggles faced by Shah Peerally himself, as well as his law firm's and his own personal experiences as a career immigration lawyer, the film is an uncompromising work of fiction depicting the trials and tribulations of immigrants seeking to partake of the American Dream. It evokes the hopes and aspirations of all immigrants to America and unravels the challenges of the American legal system and ultimate assimilation into American society that virtually every immigrant can relate to. The first part of the film recounts the story of a woman who has emerged from an abusive relationship and overcome insurmountable odds to arrive in America, only to see her dream shattered bit by bit. While the second part follows the journey of Ahmad, a man fleeing Iraq to the sanctuary of America, only to face an ordeal he had never imagined. But as with Shah Peerally's other films, "Shattered Freedom" incorporates real-life, firsthand experiences of immigration attorneys and attempts to cover a swath of major social issues related to immigration and immigrants, making the stories in this film more than just ordinary stories. Produced entirely in the Bay Area in Northern California by Shah Peerally Productions, "Shattered Freedom" showcases new local talents, with direction by Renato Asuncion, Joe Barcelone and Manny Valencia, music by Mahesh Mishra, Parminder Guri, Samir Date, Somaiya Dipalee and Geeta Madhuri, and choreography by Anna Attrey. The cast includes Shah Peerally as a lawyer, and Pavneet Saluja, Jimmy Sidhu, Jagruti Shah, Sameer Khera, Naz Khan, Mohini Foryan, Harish Sharma, Waqas Younus, Chaz Laredo, Akram Khan, Pawan Bangar, Ritu Nischal, Navin Tekchandani, Jennifer Spence, Kasim Mohammadi, Hamed Rasti, Poonam Sansanwal, and a host of other gifted Bay Area individuals. With its films, documentaries and radio shows, the Shah Peerally Production House endeavors to achieve its goals of (1) educating immigrants about their rights; (2) affording a chance to local talents; and (3) recognizing lawyers and other individuals fighting for human and civil rights.